1. A male given name: from an Old French word meaning “bearlike”. 2. 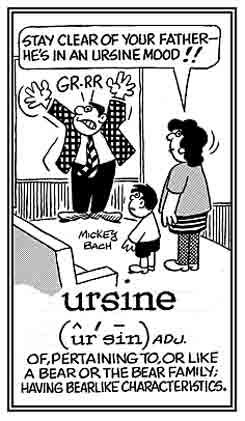 A masculine proper name, from French ourson, diminutive of ours "bear", from Latin ursus. A female-bear, also, a constellation, the feminine form of a bear. In astronomy, the "Great Bear", the most prominent northern constellation, containing the seven stars that form the Big Dipper. The "Little Bear", the constellation nearest the north pole. It contains the north star, or polestar, which is situated in the extremity of the tail. A bear is a large mammal of the order Carnivora, family Ursidae. 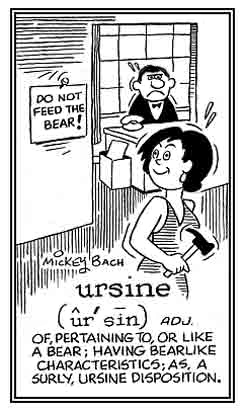 Relating to a bear or having bear-like characteristics: Todd was a football player who had ursine attitudes and physical strength when he was playing against his opponents. © ALL rights are reserved. The Canadian porcupine: "This urson is sometimes called the bear-porcupine. 1. A female given name from a Latin word meaning “bear”. 2. Saint, a legendary British princess who, with 11,000 virgins, is said to have been martyred by the Huns at Cologne. Type genus of Ursidae, brown bears; in some classifications genus Ursus includes all bears. 2. A very large fossil bear (Ursus spelaeus) similar to the grizzly bear, but larger; common in European caves. 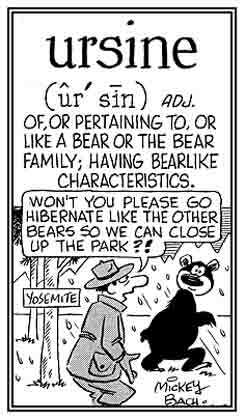 Related "bear, bears (animals)" word units: arcto-; Berserk.